Beacon Shores – Aug 2012 – Buddy the Retriever, originally uploaded by pmarkham. Buddy is a yellow Labrador Retriever that belongs to the owners of the Beacon Shores Resort in Crosslake, MN. 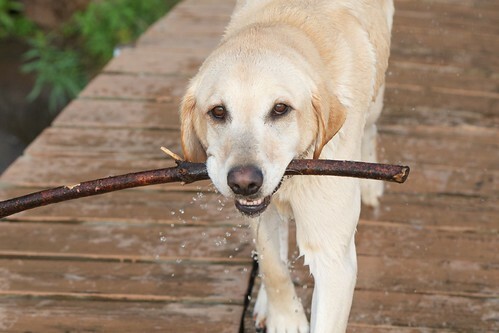 He loves to retrieve stuff from the lake and will jump right off the dock to get a ball or a stick. He’s also a super nice dog. To get this picture, I invited Buddy to play on the dock during the “Golden Hour” — the hour just before sunset. I grabbed a stick and started throwing. I used my Nikon F2.8 70-200 to capture the action.